Ableware Inflatable Crescent Shaped Shampoo Basin from HealthyKin.com fits into the space on a bed that is normally occupied by a pillow. 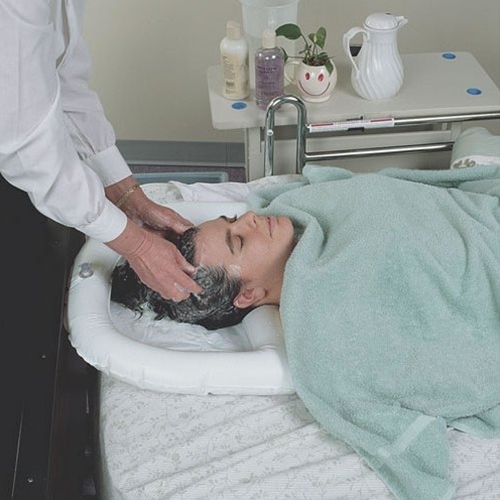 At shampoo time, the pillow is removed and replaced with the shampoo basin. No repositioning of the person being shampooed is necessary. The basin is inflated by mouth to form a semi-circular ring with a flat side for neck support. A large drain tube is located at the side for easy drainage into a pail. 12" x 8" x ½"